The Institute for Modeling Plasmas, Atmospheres, and Cosmic Dust (IMPACT) team of NASA’s Solar System Exploration Research Virtual Institute (SSERVI) recently designed and executed an experiment to test the stability of water ice in lunar cold traps in order to better understand the efficacy of in-situ resource utilization (ISRU) and the Synthetic Lunar Atmosphere Mission (SLAM) concept. Results were recently published in the journal Icarus. In space exploration, in-situ resource utilization (ISRU) is the collection, processing, storing and use of materials encountered in the course of human or robotic space exploration that replace materials that would otherwise be brought from Earth. By leveraging resources found or manufactured on-site, and minimizing the materials carried from Earth, ISRU can lower costs while increasing capabilities of a space mission. Scientists have considered using the frozen water ice in lunar soil to provide materials for life support, propellants, construction materials, and energy to spacecraft payloads or space exploration crews. Cold traps on the lunar surface may have conditions necessary to retain water ice, but no laboratory experiments have been conducted to verify modeling results. This experiment was the first to quantifiably measure sublimation of water ice, and results indicated that water ice in lunar cold traps is stable on timescales comparable to the lunar night, and should continue to be studied as possible resources for future utilization. The experiment also gauged the efficacy of the synthetic lunar atmosphere mission (SLAM) as a low-cost water resupply mission to lunar outposts without the need for a soft landing. The SLAM mission concept aims to send a large payload of water to impact the lunar surface. The resulting impact may provide a means for low-cost water resupply to a lunar outpost, if astronauts or robots can harvest water ice from the impact site. But using SLAM as a water resupply technique for a lunar outpost depends on the water staying put and not evaporating or disappearing into the lunar soil. Thus, understanding the thermal stability of ice in cold traps is crucial for interpreting the rate of capture and escape of water from cold traps. While NASA has no firm plans to return to the surface of the Moon, scientists believe that many of the resources needed to live on the moon could be mined on-site. 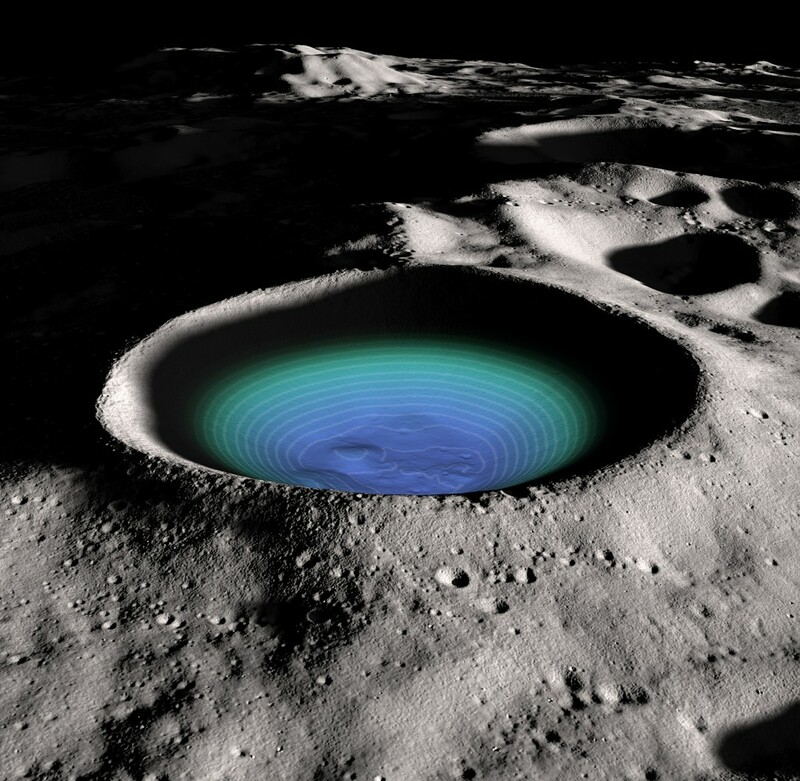 Water trapped within the soil at the lunar poles and within craters could be mined to produce drinking water or hydrogen fuel for future space missions. 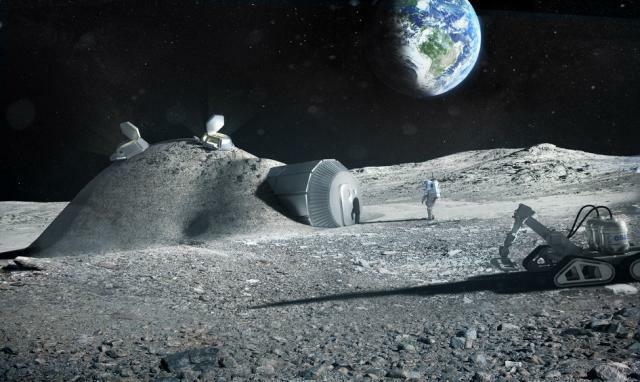 Robots and short manned missions could initially construct habitats with 3D-printed technology that uses the lunar soil as a basic building material. Credit: NASA Ames. In the paper, researchers presented the results of their experiment to explore volatile stability in lunar cold traps and assess the efficacy of both ISRU and SLAM. The experiment used vacuum and cryogenic equipment to get the JSC-1A lunar regolith simulant to ambient and internal conditions that mimic the polar regions on the Moon. Once the sample reached the desired run temperature, the experimental chamber was pumped down to a vacuum of 10−6 Torr and maintained at this pressure by continuously pumping for five days to approximate the length of a lunar night. Throughout the five-day period, temperature and pressure measurements were recorded. After five days, the experimental chamber was backfilled with dry nitrogen gas to near atmospheric pressure in order to assure minimal condensation of atmospheric water and the sample was quickly warmed to 250 K. The sample container was then removed from the experimental chamber and weighed. No significant mass loss was detected in any of the water. A. Overview of the experimental set-up and major components (vacuum system, cooling system, and the monitoring system). B. The sample container (right) and porous straw with cold fingers (left). The sample container dimensions are 13 × 8 cm. Credit: IMPACT/Piquette et al. (2017). 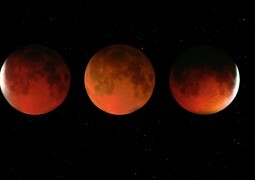 The experiments verified that mixtures of lunar regolith simulant and water ice held at thermal conditions expected for lunar cold traps, including permanently shadowed regions, will retain water ice on lunar diurnal timescales and may be considered for future ISRU. Furthermore, these findings bolster the use of SLAM-like mission architectures to supply future lunar outposts with necessary water.